Mon., Nov. 27, 2017, 10:08 p.m.
PULLMAN – The Washington State football team lost in the Apple Cup, but a new piece of hardware arrived in Pullman last weekend anyway. For the first time since 2009, when Klay Thompson’s 43-point game vaulted WSU to a win over San Diego in the Great Alaska Shootout, the Cougars experienced nirvana on a basketball court and hoisted a trophy after winning three games at the Wooden Legacy tournament on the CSU-Fullerton campus in southern California. WSU took down three of the game’s more prominent mid-major programs en route to the championship, knocking down Saint Joe’s 75-71 in the first round, No. 21 Saint Mary’s 84-79 in the semifinal and San Diego State 93-86 in the title game. Those three have combined to make 20 NCAA tournament appearances since the turn of the millennium. Perhaps this WSU team is the one most capable of ending the program’s nine-year dry spell. The Cougars (6-0) still have a tough Pac-12 slate to grind through, but in the 10-year history of the Wooden Legacy, all but one champion has gone on to qualify for the Big Dance. (WSU fans might be delighted to know that Washington, in 2014, was the only team that didn’t). The Cougars received AP Top 25 votes – 25 of them – for the first time since 2011, they’re one of 28 remaining unbeatens in the country and they were named college basketball’s “Team of the Week” by NBC Sports. Below are five takeaways from WSU’s title run in Fullerton. Malachi Flynn was named the tournament’ Most Valuable Player and Robert Franks was an easy choice for the all-tournament team. Together, those two combined to score 109 points in the tournament, each playing exactly 99 minutes. Flynn found his 3-point stroke in Fullerton and shot 12-of-24 (50 percent) from long range. That comes after the second-year point guard saw just four of his first 21 attempts fall in the Cougars’ first three games. None of Flynn’s triples were quite as consequential as a deep pull-up 3 with six seconds left and the Cougars trailing 71-70 in the opener against Saint Joe’s. Flynn followed a nine-point game against the Hawks by scoring 26 and 24 points to close out the tournament. Franks was also superb, averaging 18.6 ppg. The junior forward scored 20 points just once last season, but in an expanded role, he’s already hit that mark three times in six games this season. The Cougars had the higher-scoring bench in each of the three games. The WSU reserves outscored Saint Joe’s 19-16, Saint Mary’s 28-14 and SDSU 29-24. Flynn and Franks are better versions of their 2016-17 selves, but the impact of the players who are giving them breathers is also much larger than it was a season ago. The bench averaged 25.3 points per game at the Wooden Legacy. By comparison, it produced just 13.1 ppg last year. And the Cougars aren’t simply banking on one reserve to come in and deliver 15 points every night – the production has been scattered. In the title game it was Jeff Pollard, a reliable defensive player who refined his offensive game over the summer, who came off the bench to score 16 points. Against Saint Mary’s, Pollard and Kwinton Hinson each scored 11. Versus Saint Joe’s, Carter Skaggs was the man, chipping in nine points on a trio of 3-pointers. Kent’s teams at Oregon were reputed for shooting the 3-pointer at a high volume. The Ducks are still doing that under Dana Altman and rank 14th in college basketball with 194 attempts. 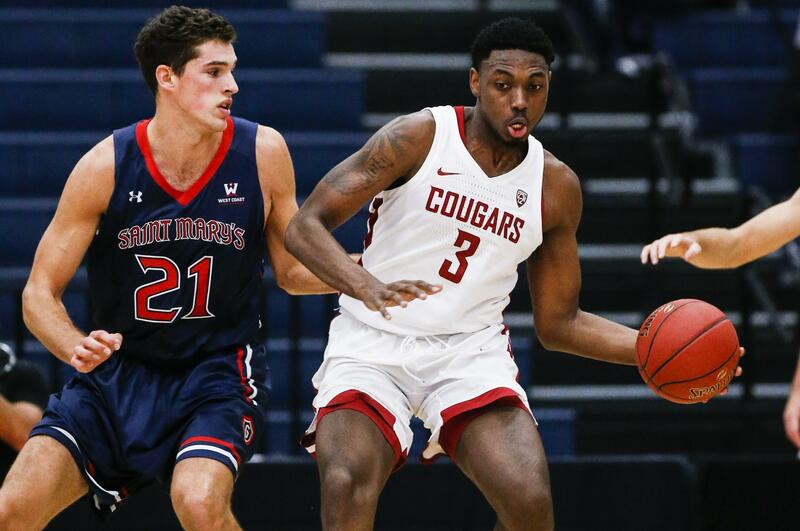 Just three spots lower behind are Kent’s Cougars, who are also firing from beyond the arc with reckless abandon – but also doing it more efficiently. WSU’s 78 makes from three-point land ranks fifth nationally and of the top five teams, the Cougars have been the most accurate, making their 3’s at a 41.7 percent clip. At the Wooden Legacy, WSU hit 35-of-82, or 43.9 percent, from deep. Back to the MVP. Flynn’s never been a reckless point guard per se, but the sophomore’s handling the ball with more care this year and it’s reflected in the stat column. He turned the ball over just three times – once in each game – while logging 99 minutes in the Wooden Classic. Flynn’s assist numbers haven’t been otherworldly this season (two per game), but that’s partially due to the number of capable ball-handlers the Cougars have on the floor at a given time. What’s important is that Flynn’s playing a crisper, more precise game this year. Before the tournament, he’d registered just one turnover, and through six games he has the country’s sixth-best assist-to-turnover ratio at 7.0. How impressive is that? The next best player in the Pac-12 is USC’s Jordan McLaughlin, at 3.5. WSU has trailed at halftime in three of its six wins – and the preseason exhibition – and the Cougars were tasked with erasing another sizable deficit in the Wooden opener. Saint Joe’s led 38-24 at the break, then grew the advantage to 17 points in the second half. The Cougars followed an 8-0 run with a 9-0 run just minutes later and Flynn stuck the dagger in the Hawks with his last-second heave from beyond the arc. Another challenge presented itself in the title game. WSU led at halftime, but the Aztecs responded with a flurry of points to lead 73-64 with 8:25 to go. Then it was time for the Cougars’ barrage. They scored 29 points in the final 8:25 to wipe away yet another deficit and emerge with the win. Published: Nov. 27, 2017, 10:08 p.m.